France gave us croissants, champagne and, er, frogs’ legs. It swept us off our feet with seductive lights in Paris, great wines around Bordeaux and sparkling sun-soaked beaches along the French Riviera. It’s one of the most visited countries in the world and yet I’ll guarantee there are places you’ve never heard about. Welcome to our inside guide to the best places to visit in France, both off the beaten track and firmly right on it. Paris makes for a world class break but fast train and plane connections also open up other parts of France. Try the Alps for ski-ing, Bordeaux for wine tasting, Lyons for food and the French Riviera for some classic, chic sun. Enjoy the delights and romance of Paris, the sights of Versailles and the seafood of Normandy, the uniqueness of Mont-St-Michel and embrace French history at The D-Day Beaches. Visit several French regions. Embrace the delights of Paris, the pristine blue waters of the Riviera, history-rich Provence, the beautiful Loire Valley and Bordeaux, known locally as 'wine country'. For me, France marks a special place as that's where I was living when I started this blog. But, luckily, you don't need to take up blogging in order to appreciate France. Just a love of good food, great landscapes...and an appreciation that the French tend to think they're pretty good too. Best way of getting around: Independent driving or fast TGV trains. Occasionally internal flights. Highlight: The Paris skyline by night. Travel tip: Plan your lunches. Many restaurants only open between 12-1.30. Also, guys, bring speedos. You won’t be allowed into pools and spas with swimming shorts. Find more unusual things to do in France here. 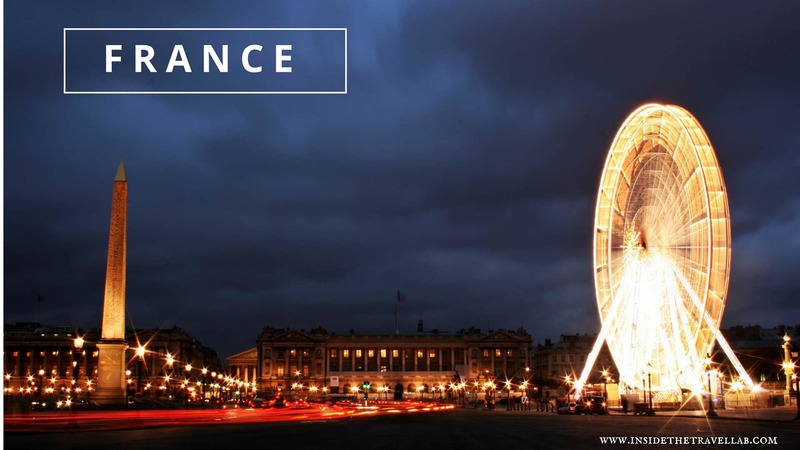 Read up on Visa requirements and safety while in France. View health information and advice for your time in France. View helpful travel advice and tips for travelling in France.